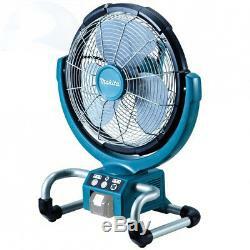 Makita DCF300Z 18V LXT Lithium-Ion Cordless 13-Inch Job Site Fan. The Makita 18V LXT Lithium-Ion Cordless 13Job Site Fan (DCF300Z, tool only) is another portable and powerful cordless solution for contractors. Three speed settings and an oscillation selector lets the user select optimal air velocity and control. For added convenience, the 3-stage automatic timer offers 1, 2 and 4-hour power-off selection. The fan has a durable design and the protective bumpers are engineered to withstand a job site environment. The DCF300Z is compatible with Makita 18V batteries with a star symbol. Its part of Makitas expanding 18V Lithium-Ion series, the worlds largest cordless tool line-up powered by an 18V Lithium-Ion slide-style battery. Makita 18V Lithium-Ion batteries have the fastest charge times in their categories, so they spend more time working and less time sitting on the charger. Durable design engineered to withstand a job site environment. Frame structure engineered to reduce wind noise. 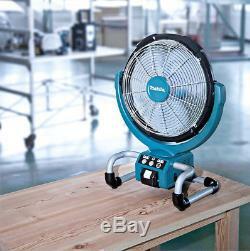 Three settings (high&###x2F;medium&###x2F;low) and oscillation selector for optimal air velocity and control. 3-stage automatic timer with 1, 2, and 4 hour power-off selection. Removable front guard for convenient clean up. Item Weight: 11.24 pounds. Product Dimensions: 19 x 13 x 24 inches. Batteries: 1 Lithium ion batteries required. Battery Cell Type: Lithium Ion. And we will work with you to resolve it to your satisfaction. The item "Makita DCF300Z 18V LXT Lithium-Ion Cordless 13-Inch Job Site Fan" is in sale since Tuesday, March 13, 2018. This item is in the category "Home & Garden\Yard, Garden & Outdoor Living\Lawn Mowers\Lawn Mower Parts & Accessories". The seller is "ezilla3" and is located in US. This item can be shipped to United States, Canada, United Kingdom, Denmark, Romania, Slovakia, Bulgaria, Czech republic, Finland, Hungary, Latvia, Lithuania, Malta, Estonia, Australia, Greece, Portugal, Cyprus, Slovenia, Japan, China, Sweden, South Korea, Indonesia, Taiwan, South africa, Thailand, Belgium, France, Hong Kong, Ireland, Netherlands, Poland, Spain, Italy, Germany, Austria, Israel, Mexico, New Zealand, Philippines, Singapore, Switzerland, Norway, Saudi arabia, Ukraine, United arab emirates, Qatar, Kuwait, Bahrain, Croatia, Malaysia, Brazil, Chile, Colombia, Costa rica, Dominican republic, Panama, Trinidad and tobago, Guatemala, El salvador, Honduras, Jamaica, Antigua and barbuda, Aruba, Belize, Dominica, Grenada, Saint kitts and nevis, Saint lucia, Montserrat, Turks and caicos islands, Barbados, Bangladesh, Bermuda, Brunei darussalam, Bolivia, Ecuador, Egypt, French guiana, Guernsey, Gibraltar, Guadeloupe, Iceland, Jersey, Jordan, Cambodia, Cayman islands, Liechtenstein, Sri lanka, Luxembourg, Monaco, Macao, Martinique, Maldives, Nicaragua, Oman, Peru, Pakistan, Paraguay, Reunion.